Volkswagen has a tradition of making it on the Favorite Website Awards (FWA) website which recognizes highly creative, also usually highly frustrating user experience websites. One site that showed up on FWA this year was Volkswagen’s Eos Open Cage site. Eos Open Cage is a Brazilian online experience described as an “interactive short film.” It is that. Basically, a woman (the Eos target consumer, I'll assume) drives around in a top down VW Eos where she weaves around open roads avoiding Hitchcockian birds that are trying to disrupt her country drive. Playing involves some keyboard keys to avoid birds where one can swerve away or speed up. It’s pretty simple stuff with visual cues when to press an arrow key. If user response is too slow, a warning pops up explaining how to play. It is not a game as there is no score or timing, the site plays in the space of interacting with the film. The implementation is really simple and clean where video is used in a way that is more engaging than simply pressing a Play button. One challenge a lot of sites have is the overuse of video content with no interactive element. 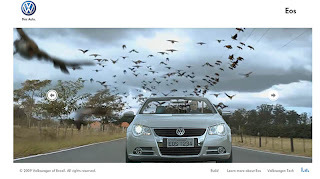 Here VW Brazil finds a way to make video more interesting. How Does It Reconnect the Shopper? Linking to the main shopping site is easy and clear in the lower navigation. Also, once one is at the landing page for the VW Eos the video intro for the Open Cage site plays and there is a promotional box that lets users visit the Open Cage site. A Build & Price link is also conveniently provided as is a link to the Technology page of the shopping site where one can learn about the features of the car. Overall it is a nicely done experience that doesn’t get too technical, too game oriented, and nicely extends the usually passive video watching behavior most automotive sites rely too heavily on. Now if only we can get VW to do a Bugatti version with one very aggressive pelican. * The Bugatti story seems to have been staged as the “owner” owns a wrecked exotics repair company and was also the driver a “wrecked” Ferrari Enzo.